Many new tourist attractions in India saw the daylight by the end of 2018 and at the onset of 2019. Of those,India’s tallest Shiva lingam in Kerala and India’s first devotional theme park in Shirdi have already managed to feature on several lists of the best Indian tourist attractions. Other than the Sai Temple, one of the highest-earning temples in India, Shirdi has got a brand new attraction to amaze millions of people. Unlike religious places or pilgrimage sites in India, Sai Teerth Theme Park offers a different experience altogether for both solo pilgrims and family travelers with kids. We at Travel Beats, a leading portal for Indians abroad by Indian Eagle Travel, offer a sneak peek into Sai Teerth Theme Park in Shirdi and reason why India’s first devotional theme park is a must visit in 2019. 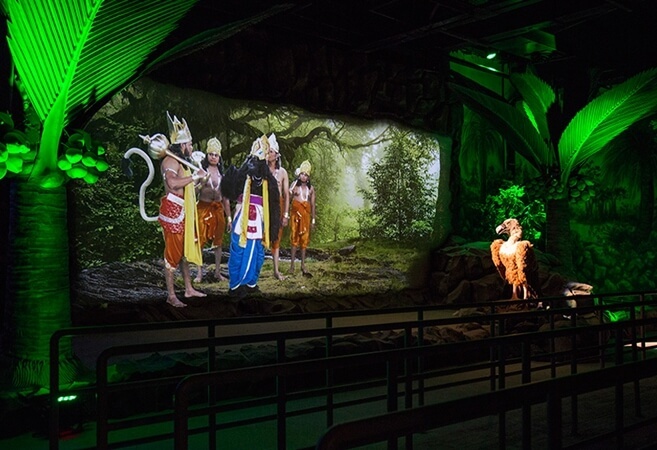 India’s first devotional theme Park, Sai Teerth takes visitors on a thrilling ride of multidimensional simulation experience in 5D technology through the screening of a 26-minute film on Hanuman’s Lanka Dahan. Lanka Dahan is a widely popular tale from the epic Ramayana. Lanka Dahan at Sai Teerth Theme Park depicts Lord Hanuman’s flight to Lanka in search of Sita and his act of setting Lanka ablaze, with accentuated, special effects like water, fire and wind. 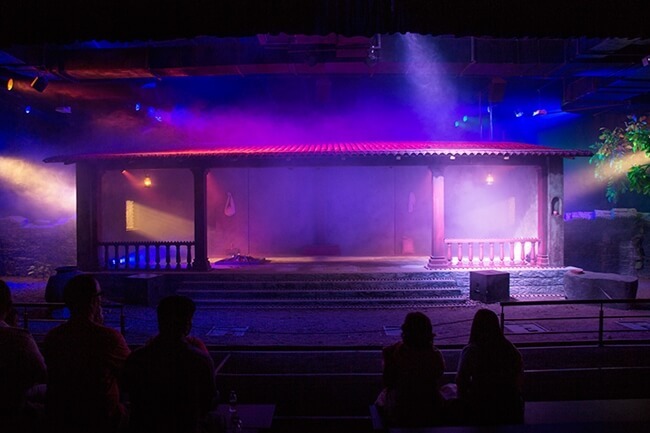 An interface between the best of entertainment and that of technology, the Lanka Dahan Theater at Sai Teerth makes it one of the best new tourist places in India 2019. One of the best places to visit in Shirdi temple town, the Sai Teerth Theme Park houses a colossal replica of the India known for its pilgrimage sites, in a 40,000-sq-ft indoor complex. Teerth Yatra at India’s first devotional theme Park in Shirdi is a virtual journey in an automated vehicle to some of the most popular holy destinations of India: Kedarnath, Badrinath, Tirupati Tirumala, Madurai’s Meenakshi Temple, Dwarka in Gujarat, Puri Jagannath Temple, Siddhivinayak Temple in Mumbai, and Pandharpur’s Vithoba Temple. Teerth Yatra at Sai Teerth is an engaging walk through the age-old Indian temple architecture and the cultural diversity of India from north to south and from east to west. One of India’s new tourist attractions in 2019, Sai Teerth Theme Park houses an eye-catching replica of the 100-year-old Dwarkamai, a dilapidated mosque where Lord Sai Baba stayed till the end of his life, cured people of ailments, initiated them into spirituality, and preached “God is one.” Dwarkamai at Sai Teerth runs a 10-minute unique show on Lord Sai Baba, using world-class robotics and animatronics. There is a seating arrangement for 250 people to watch the show on Sai Baba at the first-ever devotional theme park in Shirdi, India. Among the new tourist places in India, Shirdi Sai Teerth is the only theme park to feature a huge theater with a cinema screen of 36×72 feet. A custom-made, 60-minute film on Sai Baba’s life, hardships, miracles and teachings is shown here several times a day. Titled ‘Sai Baba – Sabka Malik Ek’, the film is one of the four attractions at Sai Teerth Theme Park in Shirdi. 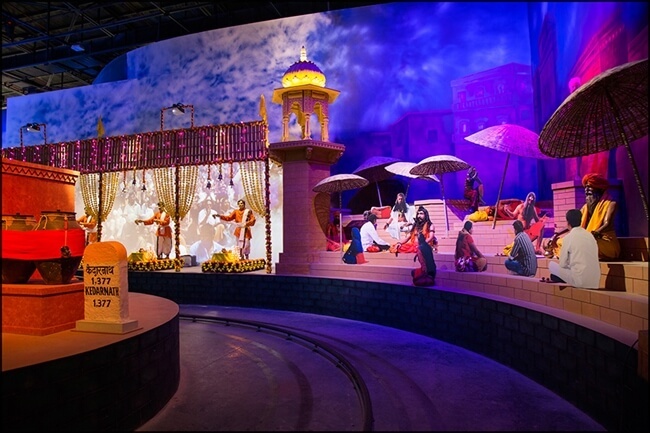 The theatrical experience lingers on the minds of the people even weeks after their visit to India’s first devotional theme park.